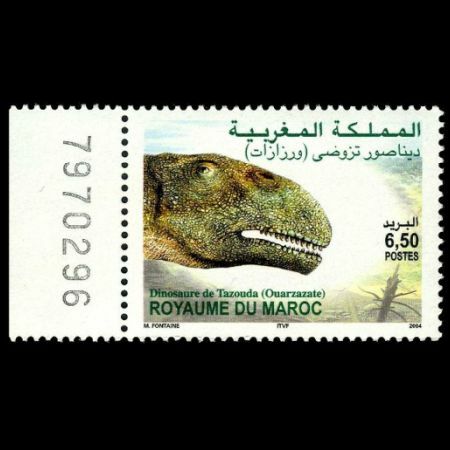 Morocco 2004 "Dinosaur of Tazouda (Ouarzazate)"
On September 2004 Post Authority of Morocco, Barid Al-Maghrib, issued a stamp commemorate discovery of newly discovered dinosaur type: Tazoudasaurus - the oldest dinosaur fossils, aged about 180 million years, found to date (2004). The bones found in Tazouda include a jawbone with 17 teeth. Tazoudasaurus is a genus of vulcanodontid sauropod dinosaur hailing from the Early Jurassic period - a small sauropod at 9 meters long (30 ft), is characterized by rather primitive features such as the prosauropod-like mandible with spatulate and denticle-bearing teeth, lack of an U-shaped mandibular symphysis as other more derived sauropods. Teeth wear in V-shaped marks indicates tooth occlusion, suggesting that vulcanodontids processed food orally when feeding. The neck is flexible with elongate vertebrae that lack true pleurocoels while dorsal and caudal vertebrae series tend to be more rigid. 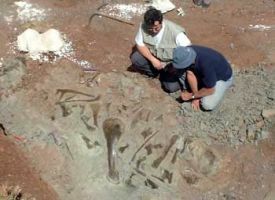 Tazoudasaurus naimi bears the most complete fossil skeleton for Early Jurassic sauropod remains found to date due to the scarcity of exposed strata of that age. This sauropod is most closely related to Vulcanodon differing only in caudal vertebrae features while it also possesses characters that place it outside Eusauropoda. The remains, consisting of a partial adult skeleton and associated partial juvenile skeleton found in continental detrital sediments by a team of international paleontologists, from the north African kingdom, France, Switzerland and the United States, headed by Frenchman Philippe Taquet, in Tazouda, 70 kilometres (42 miles) from Ouarzazate in southeastern Morocco, were described by Ronan Allain et al. 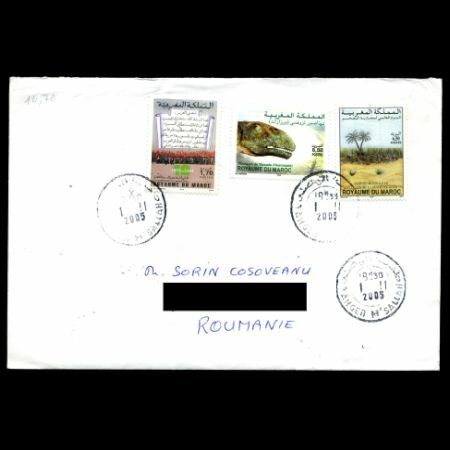 in early 2004. 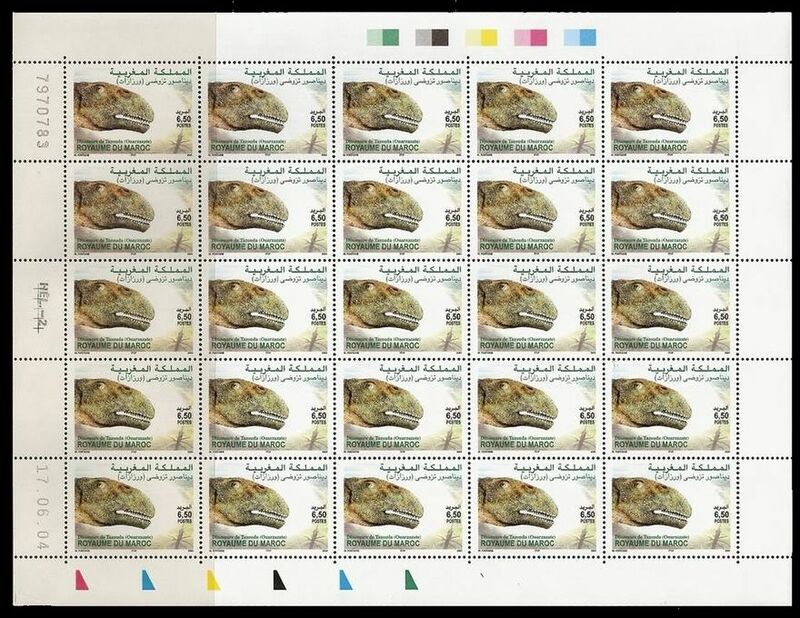 The generic name derives from one of the localities, Tazouda, while the specific descriptor is a latinization of the Arabic term for "slender" due to the animal's small size for a sauropod. 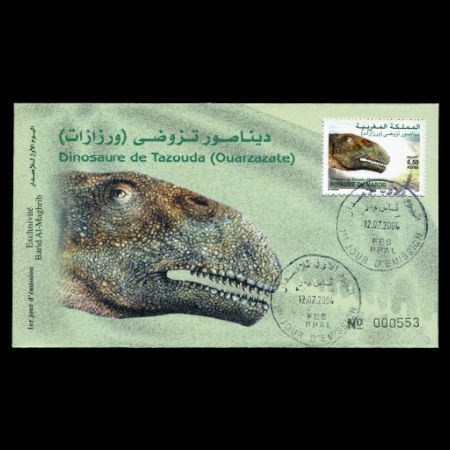 Officially named "Tazoudasaurus Naimi", the newly discovered creature is key to understanding the evolutionary process of large vertebrates, said Philippe Taquet, head of the natural history museum in Paris. 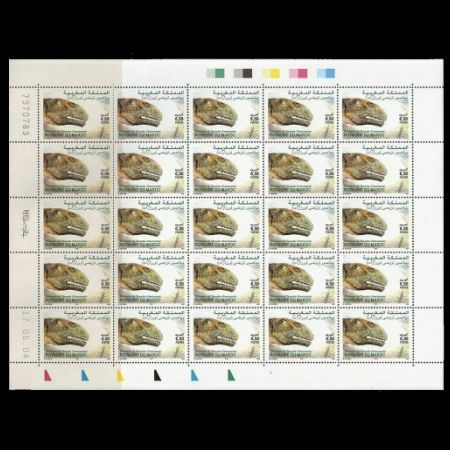 Morocco has allocated some 440 million USD to build a museum that will host the Tazoudasaurus Naimi dinosaur exhibits in the Iminoulawen Valley of the southern city of Ouarzazate.